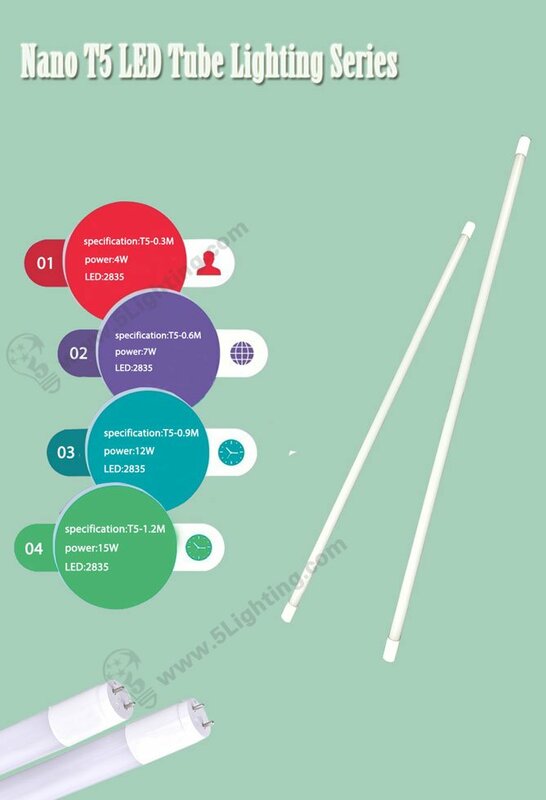 Nano LED Tube Lighting Series adopt nano wire as material, because aluminum lead tube easy to break and glare, it’s difficult to obtain safety certification. Our tube’s CRI are over than 80 Ra and it used by Nano Tech material light guide which have extremely high light transmission ratio. Compared with glass led tubes, nano LED Tube Lighting Series don’t have conductive risk and light transmittance is high. Normal plastic tubes are easy to be bent, flame retardant is poor and easily to turn yellow, but nano tubes will not. Nano T5 LED Tube Lighting Series transmittance is over 92% and the degree angle is 330 degree which is no glare, no flash, no light and no thin. Meanwhile, it can connect without shadows and is easy to install. Nano T5 LED Tube Lighting Series is easy to install, if it’s magnetic ballast, you just simple change the starter to an LED starter and fix. However, for electronic ballast, you must remove the ballast and reconnect. Nano LED Tube Lights use the double color concentrated light constant current drive, high transmittance no broken, more energy saving and environmental protection. Nano T5 LED Tube Lights are various of model to choose, our factory has 1 foot, 2ft, 3ft and 4ft tubes with consumption power range from 5W~23W，and the CCT is 3000-6500K.